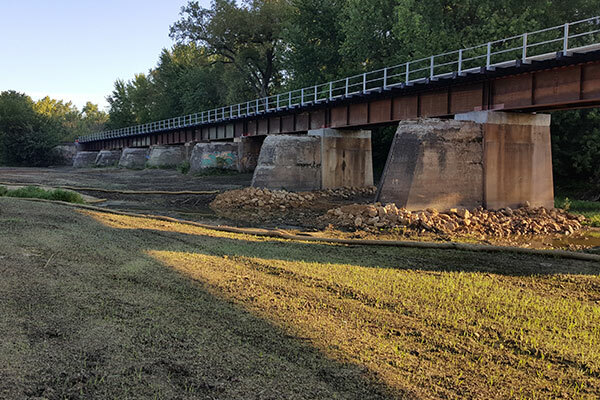 Kraemer assisted Canadian Pacific Railway crews with the construction of the last 12 of 21 steel deck plate girder spans connected to a lift bridge over the Mississippi River near Hastings, MN. Canadian Pacific crews changed out the track structure on top of the new deck plate girder and Kraemer replaced the old steel with new spans. Once in place, the new track structure was connected to the existing track structure. Track time constraints required efficient construction and placement. Kraemer changed an individual deck plate girder span, which included track structure work, in a 6-hour work window and took advantage of other work outages to install two spans at a time in a 10- to 11-hour work window.